“Oh, you Row? Your arms must be big,” is a common statement I receive when I tell someone I’m a rower. The comical part is that this is so wrong, (and they soon realize this when they see that I do not in fact have big arms). Read on to discover more about this unfamiliar sport and what it is like to be a rower. Maybe you have seen a boat go by as a nice backdrop in a movie, watched rowing in the Olympics, or maybe you’ve even read Boys in the Boat. Regardless of your knowledge, I’m sure you don’t know what the sport is all about. I’ll start with the boat, as it is clearly the most important part of rowing. The boats, or shells, come in four sizes. There is a full eight, a four, a double, and a single, corresponding with the amount of rowers in the boat. There are also two types of rowing; you can row normally with two hands on an oar or scull, which is one hand on each oar. 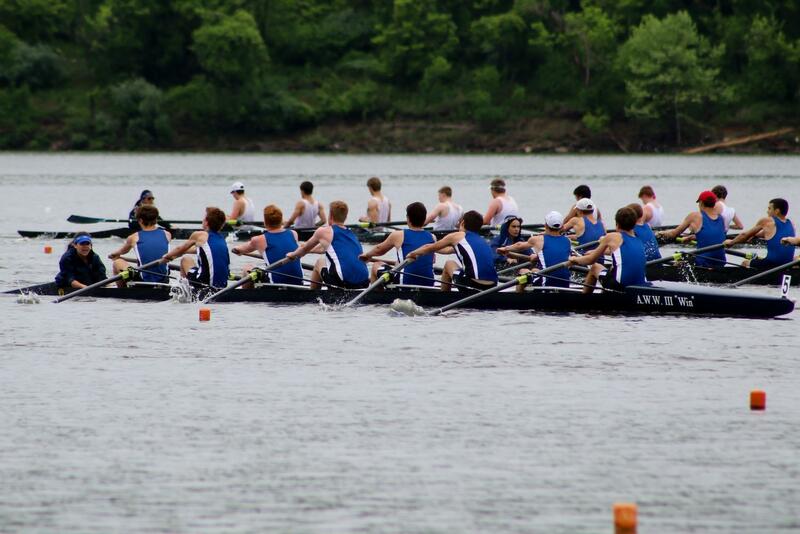 The rowers of Homestead compete through the Milwaukee Rowing Club. You can see the boathouse on Commerce Street next to the Lakefront Brewery. The high school team practices on both the Milwaukee and Menomonee Rivers downtown, and, on calm days, the team practices in both the inner and outer harbor of Lake Michigan. As the ice freezes in the winter, we move indoors to a training facility on Pleasant Street fittingly nicknamed Fight Club after the 1999 movie. Fight Club has an unique atmosphere which combines the basement of an office building with Rowing Posters, over 80 ergs (Rowing Machines), and loud rap music. The joint suffering that rowers endure creates an unbreakable bond between us that is necessary for the team work on the water. Rowers have certain ticks and phrases that are unique to the sport. The “set” is the balancing act of getting everyone to raise their hands, or “feather” your blade at the same time, or even holding your body in the same position. While keeping these in mind, you have to push your body to its limit. When all of these things align, the boat “swings.” There is an euphoric feeling as the boat balances perfectly on its hull and takes off. I love rowing because it is unlike any other sport. It’s unique, demanding, often painful yet rewarding. Rowing allows me to see the city from a different point of view every day. Especially after a stressful school day, it’s enjoyable to be outside on the river underneath the city. I hope the next time you see a shell you have a little more knowledge about the sport and more respect for the rowers as well. Perhaps you could give rowing a chance or maybe even watch it as we row downtown. Please just don’t shout “row” everytime we take a stroke.